Risks are part of every business operation and can never be avoided completely. To minimize the danger of corporate crisis, a conscientious and responsible approach to the handling of risks and the resulting impact on business is essential. Unforeseen events pose an especially great challenge for companies and require quick decision-making and immediate reactions. This paper presents a way of structuring decision problems as part of a concept for accelerated decision-making in the context of response to risk. The locus of our research is freight villages, which represent a typical example of logistics agglomerations, and the focus of our research are their business processes, which mainly consist of storage, transport and handling of freight. 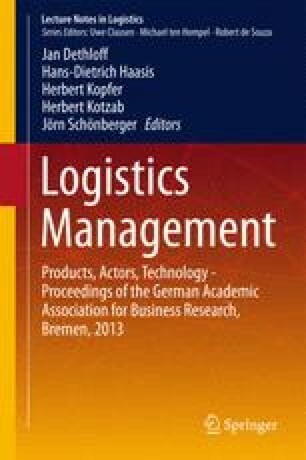 The research underlying this paper results from the project “PreparedNET”, funded by the German Federal Ministry of Education and Research (BMBF) as part of the announcement “Securing Supply Chains” in the programme “Research for Civil Security” by the Federal Government. It is part of the “Federal Governments’ Hightech-Strategy” (promotional reference: 13N11136).